Today's update is short but sweet. Many of our backers have been asking to get the game on a console and now we are polling you to see if that's something we can make happen! Re: Updated Our Journal #64: Console Copies for Backers – We Need Your Input! Very nice to see another shoutout for BeautifulDesolation from you. They really need more attention. And it´s good to see that you try to help fixing some backers problems. But anyways, you should probably still hire a PR-Manager. I would like to know if its possible to change my digital PC copy for a console copy of the game ? If I remember correctly when I backed the game in 2015 there was no console versions announced yet. Heindall_BR wrote: I would like to know if its possible to change my digital PC copy for a console copy of the game ? As the update mentions, we cannot offer exchanges, but we can offer console add-ons for an $18 USD (1,800 fee) provided that we hit our minimum order requirements. We're polling backers on the page linked to in the update in order to see if we can hit the minimum order numbers needed to offer the console codes. If we do hit those requirements, then that would give a digital console code to anyone who pledges for a console add-on, in addition to their existing PC copy. The only options for PS4 are Europe and America, does that mean Australians are ineligible for console copies? nitch wrote: The only options for PS4 are Europe and America, does that mean Australians are ineligible for console copies? That said, I don't think Sony has an official list available, so you might want to contact Sony directly to see which region applies in your case. Any word on when we will know if there was enough interest for the console versions? I know that I would love to have a PS4 and a PC version, don't mind supporting you guys! How many IS the minimum before the purchase is made? 1,000? 10,000? 100,000? I would definitely like to know how nervous I should be about this. Because I really want a console copy. Rezindez wrote: How many IS the minimum before the purchase is made? 1,000? 10,000? 100,000? I would definitely like to know how nervous I should be about this. Because I really want a console copy. I don't think there were a hundred thousand backers. Hello, I was an original Kickstarter backer. It has been some time since then and I am excited to see the wonderful game experience you all have worked so hard on! That being said, I've combed over the website several places and have yet to see minimum/optimal system specs posted. I'm considering switching over to the X-box One version if my relatively new (back in 2015) computer will no longer be up to the challenge. Would you kindly post a link or reply with those stats please? Pheregas wrote: Hello, I was an original Kickstarter backer. See this page at GOG. For some reason I am not able to request/add a PS4 digital copy to my pledge. Is anyone able to do this? Apparently we had until the 28th. HEVampersand wrote: For some reason I am not able to request/add a PS4 digital copy to my pledge. Is anyone able to do this? Apparently we had until the 28th. The page was taken down yesterday. No official word on the reasons. Am I late ? I used to be a PC players all those years ago I pledged 30$ on kickstarter but I play mainly on PS4 these days so I would prefer a key for the console over a PC if I could pick once the game releases. sinnerbeta wrote: Am I late ? I used to be a PC players all those years ago I pledged 30$ on kickstarter but I play mainly on PS4 these days so I would prefer a key for the console over a PC if I could pick once the game releases. 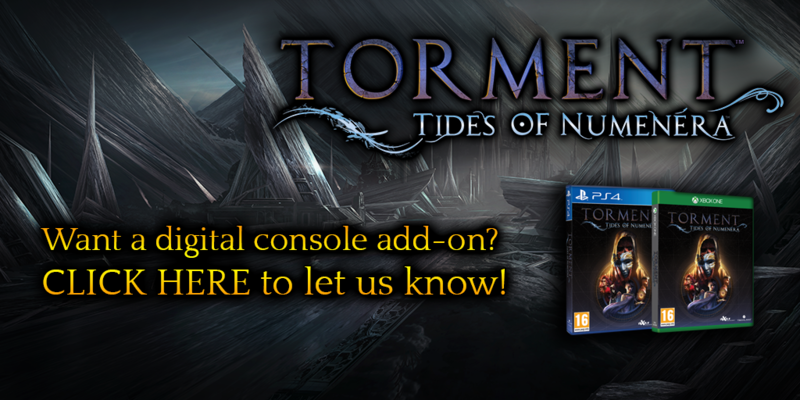 Thanks for expressing your interest in getting a digital add-on console copy of Torment: Tides of Numenera. We previously stated that we needed to pay console platform holders for each individual console code we got, plus hit a minimum order count for each console. Despite getting responses from hundreds of our backers, we did not end up reaching the required minimum number we needed to. Unfortunately, that means we won't be able to offer the $18 console add-on to backers. While the console version wasn't part of our initial Kickstarter pitch, we know some of you did want that as an option, so we're a bit bummed we didn't quite reach the goal too. That said, the PC version of Torment will run on Windows, Mac and Linux, and offers the choice of using both mouse & keyboard as well as controllers, so the couch experience is still within reach for PC players! If you are still interested in purchasing a console copy of the game, you may also do so at any local or online retailer, or digitally on Xbox Live or PlayStation Network. Thank you for your support, and we hope you enjoy the game on PC once it launches this Feb. 28th! Bummer, thanks for the reply. I didn't even see this was an option until today. I'm already sore over the fact that I backed a game in 2013 that I now won't be able to play because I no longer have a gaming PC (my own responsibility, sure), but when the console version was announced it was doubly-damning to have paid $143 and then have to buy the thing again. A clue: I won't. Makes me wonder how many people, like me, who don't follow InXile updates on a daily basis (I get that this is a big thing for you guys and a few thousand fans, but it's just another day for most of us) missed this altogether. How much demand there would actually be if it had been offered all the way up until today. Maybe with some sort of concerted campaign on our behalf that had a meter of total wanted vs total needed, y'know kinda like Kickstarter. Oh well, back to my hope that it'll just end up on PS Plus for free in six months' time instead. I likewise never received the email announcing that the option for the $18 upgrade had not received sufficient support from enough backers. Which has me worndering how many folks didn't receive the original email presenting the poll?